Always check the news page for ongoing or upcoming activities! 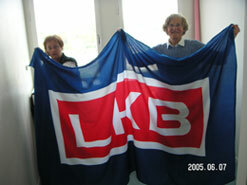 LKB was founded in 1943 with activities in Alvik, but moved to Mariehäll in Bromma in the 1950s. In the beginning the focus was on technical consultancy services, but was soon directed towards products based on research at Swedish universities. We all know the success and reputation LKB enjoyed worldwide - as it became one of the leaders in the service of science. After the merger with Pharmacia Fine Chemicals, LKB disappeared as a company and as a brand name, but its products and the people behind the success are still around. With joy and pride we remember "The Spirit of LKB" - the driving force behind our success. This was something that we really experienced once again during the reunion on June 11, 2005. Many who participated in the reunion and a number of those who could not participate have asked for some kind of continuation. As a response to this request, we now continue the maintenance of this web site, by which we try to give everybody - who in any way had a connection with LKB - the opportunity to stay in touch, and exchange information. We expect your help in keeping this web site alive and up-to-date by your own contributions in the LKB forum.